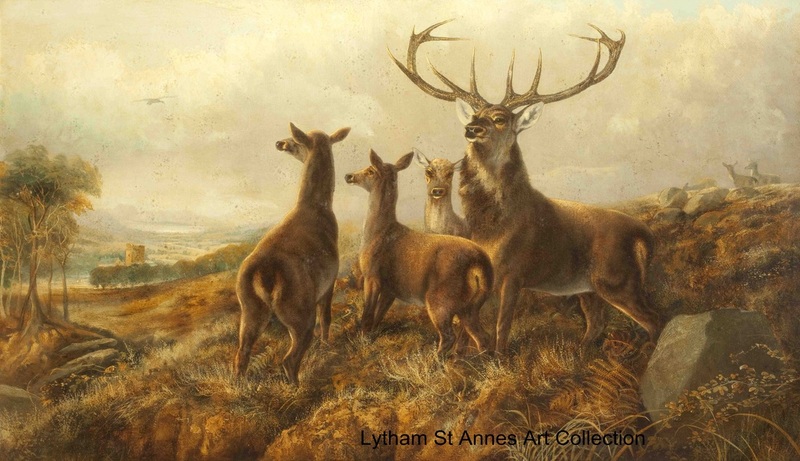 This painting was previously attributed to Richard Ansdell (1815-1885) although his great great grand-daughter, Sarah Kellam, an expert on his work, does not recognise this to be an Ansdell painting. We have recently been advised by Fylde Council that Christies have re-attributed it to Clarence Roe. They state that it is ‘signed with initials C.R.' although it is difficult to make out any kind of signature on the painting. Clarence led a colourful life. At the age of twenty he married sixteen year old Almira Sherborne, daughter of a Bristol artist, Henry Sherborne. The couple had one child, also Almira, born in 1871. His wife presumably died some time between 1871 and 1875 when he remarried. His second wife, Rosa Adelaide Hulme, divorced him four years later. In her petition filed on 29 October 1878 she cited not only his desertion and adultery with a number of women but also of him having ‘wilfully and recklessly’ infected her with venereal disease. The divorce was granted in November 1879. (12) The following month Rosa gave birth to a daughter who lived only a few weeks. He married a third time in 1881 to Ellen Fenely Fletcher. In 1890 he was found guilty of stealing a leather bag and articles of clothing from Leeds railway station. He had alighted from the train from Harrogate and the items belonged to another passenger. His defence lawyer argued that Roe had a similar bag and was too drunk to realise that it wasn’t his property. The judge said that he had known the prisoner’s name and that of his family of artists in the West Riding of Yorkshire for many years and it was painful for him to have to pass sentence. He believed that Roe had brought it on himself by giving way to excessive drinking which prevented him from living in affluence as he might. Roe was sentenced to three months imprisonment, including a month’s hard labour. (15) In the 1891 census his wife, Ellen, was in a hotel in Scarborough alone with her children. She described herself as an artist (landscape). (5) The family’s movements can be tracked by census information and by the birthplaces of their eight children. (9) Most of the information about members of the Roe family in this article has come from research of primary sources, including census listings from 1841 to 1911, GRO indexes, parish records and probate. This document was supplied by Mark Davies (see ref 14). (22) This undated obituary is contained in a newspaper cutting filed with Roe’s records from Menston Asylum.